Conceding to a federal lawsuit, the US government agreed to release a 1987 Defense Department report detailing US assistance to Israel in its development of a hydrogen bomb, which skirted international standards. 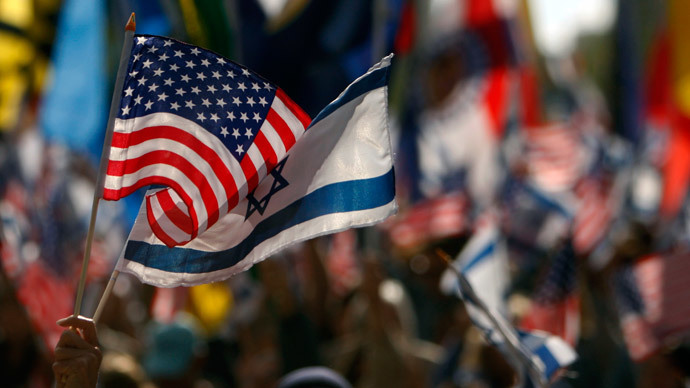 The 386-page report, “Critical Technology Assessment in Israel and NATO Nations,” likens top Israeli nuclear facilities to the Los Alamos and Oak Ridge National Laboratories that were key in the development of US nuclear weaponry. Israelis are “developing the kind of codes which will enable them to make hydrogen bombs. That is, codes which detail fission and fusion processes on a microscopic and macroscopic level,” said the report, the release of which comes before Israeli Prime Minister Binyamin Netanyahu’s March 3 speech in front of the US Congress in which he will oppose any deal that allows Iran’s legal nuclear program to persist. “I am struck by the degree of cooperation on specialized war making devices between Israel and the US,” Roger Mattson, a formerly of the Atomic Energy Commission’s technical staff, said of the report, according to Courthouse News. The report’s release earlier this week was initiated by a Freedom of Information Act request made three years ago by Grant Smith, director of the Washington think tank Institute for Research: Middle Eastern Policy. Smith filed a lawsuit in September in order to compel the Pentagon to substantially address the request. “It’s our basic position that in 1987 the Department of Defense discovered that Israel had a nuclear weapons program, detailed it and then has covered it up for 25 years in violation of the Symington and Glenn amendments, costing taxpayers $86 billion,” Smith said during a hearing in late 2014 before Judge Tanya Chutkan in US District Court for the District of Columbia. Smith described in his federal court complaint how those federal laws were violated by the US in the midst of Israel’s budding nuclear program. “The Symington Amendment to the Foreign Assistance Act of 1961 prohibits most U.S. foreign aid to any country found trafficking in nuclear enrichment equipment or technology outside international safeguards,” Smith wrote. In November, Judge Chutkan asked government lawyers resistant to the report’s release why it had taken years for the government to prepare the report for public consumption. 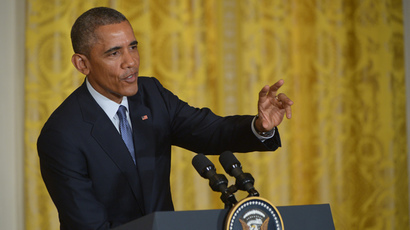 “I’d like to know what is taking so long for a 386-page document. The document was located some time ago,” Chutkan said, according to Courthouse News Service. Smith and the US agreed that the government would redact sections of the report on NATO countries, though the passages on Israel remain intact. “The capability of SOREQ [Soreq Nuclear Research Center] to support SDIO [Strategic Defense Initiative Organization, or “Star Wars”] and nuclear technologies is almost an exact parallel of the capability currently existing at our National Laboratories,” said the report, written by the Institute for Defense Analysis for the Department of Defense. 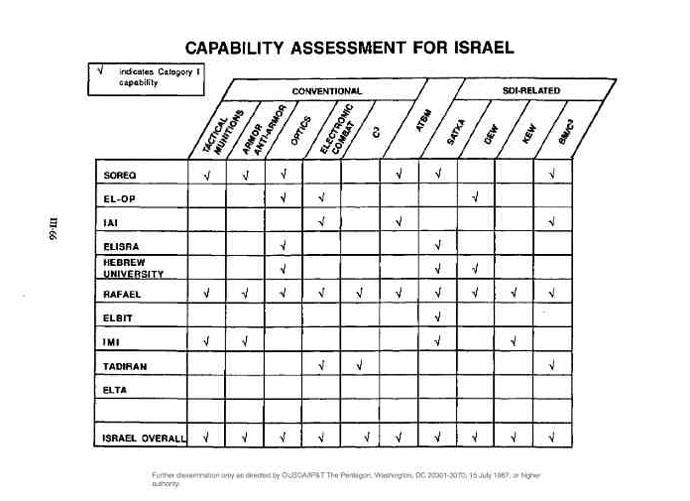 The report’s authors Edwin Townsley and Clarence Robinson found that Israel to had Category 1 capability regarding its anti-tactical ballistic missile and “Star Wars” weapons programs. Israeli Prime Minister Binyamin Netanyahu’s planned address before the US Congress was controversially arranged by Republican leadership without consultation of congressional Democrats or the White House. The speech will occur weeks before Netanyahu will seek reelection, and is to center around his opposition to any agreement with Iran over its nuclear program, a deal the US — while levying heavy sanctions on Tehran — has pursued despite protests from its preeminent ally in the Middle East, Israel. Tehran’s nuclear program is legal under the terms of the Nuclear Non-Proliferation Treaty, to which Israel is one of the few United Nations members that is not a signatory.